Ashley practices physical therapy at the UW Health Rehabilitation Clinic in Middleton. Her area of practice is in neurological rehabilitation, treating patients with a variety of neurological conditions such as stroke, Parkinson's disease, traumatic brain injury, spinal cord injury, multiple sclerosis, balance disorders and vestibular disorders. 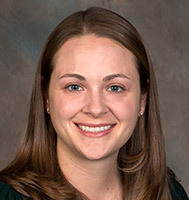 Ashley holds a Bachelor of Science in Biology and a Doctorate of Physical Therapy, both from the University of Wisconsin-La Crosse. She is certified in the LSVT BIG program for patients with Parkinson’s disease and is a credentialed clinical instructor through the APTA.